The first thing we look at are the ACT and SAT equivalent numbers. We put more emphasis on these numbers than on the percentiles because, generally speaking, the pool of SAT test takers is stronger. If the equivalent numbers are close, we usually look at the science score on the ACT: if the science is bringing the composite down, we usually explore that with the student. The rule of thumb is that if the science score is the lowest of the four, and scores are equivalent, we lean SAT. If the science is the highest score by some margin, we consider that the ACT might be a better choice. 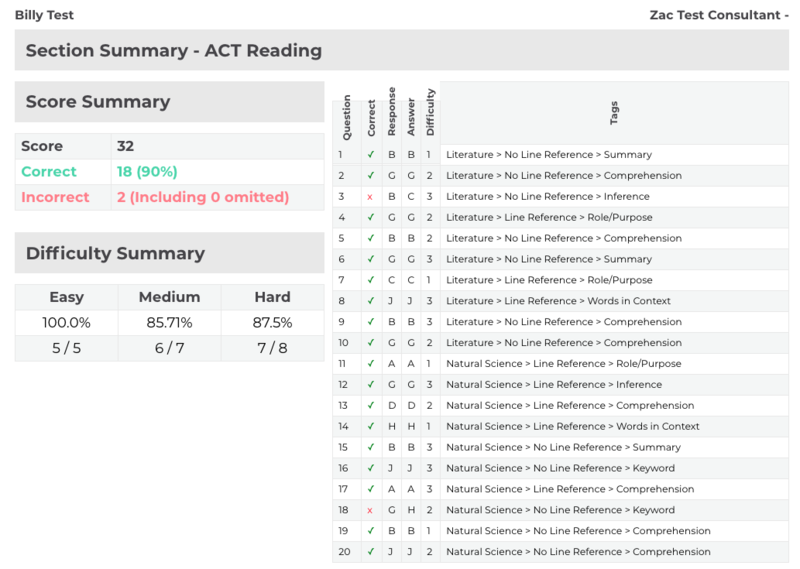 If ACT reading and science scores are lower than the English and the Math, we like to ask whether the student can process quickly and has a strong working memory. We do this because the ACT reading and science require students to move very quickly and retain a great deal of information. The SAT reading does not require a student to process as quickly and there is no science on the SAT. At a glance, this section highlights where the student needs the most work. In the case of the SAT score above, this is the math and then the reading. We'd share that as the student has a perfect Writing and Language score, we could have the student take practice tests on his or her own while we're working on the reading. If the student continues to score in this high range, then there will be no need to prep. If he or she scores below the 35 range, than we can talk about prep. It also let's you see if a student is rushing to finish and missing easy questions at the start, which is common for really strong students. Strong students often start fast (particularly on the math), making early, unnecessary errors. We can assume the mistakes were careless because the student missed questions two and three on the math, which is a section that gets progressively harder. For the SAT reading, we can assume the student's area of weakness is literature because the incorrect answers were all in the first passage. The ACT math results might suggest that the student drifted for a bit in the middle. Notice the three early questions the student missed in close approximation: after those, the student got the next eight correct, which are more difficult than the ones previously missed. We'd ask if the student tends to lose focus from time to time. This is further evidence that this student is better suited to take the SAT because he or she got more easy, medium and hard questions right on the SAT than on the ACT. However, if a student answers far more hard questions correctly on the ACT, it would give us a reason to suggest the ACT because there would be less improvement required for the most challenging questions. The cover page of the report uses the business logo that you upload in your profile. By default it will use our logo. The name you enter in your profile shows up under "Assigned By." In other words, make sure you enter your profile info after you sign up. The section summaries allow us to look more closely at each section. For instance, the first thing we look at on the reading is to see if one of the reading categories (Literature, Dual Passages, Social Studies, Science) is more of a problem than the others. That section lets us immediately see where students have to focus first. We then like to look to see the types of questions (summary, role/purpose, words in context, comprehension, line-reference, non line reference) the student missed and if there were any omitted questions. For the reading, this question analysis provide insight into whether a student is missing more general questions, or whether the student struggles with close reading of particular lines. 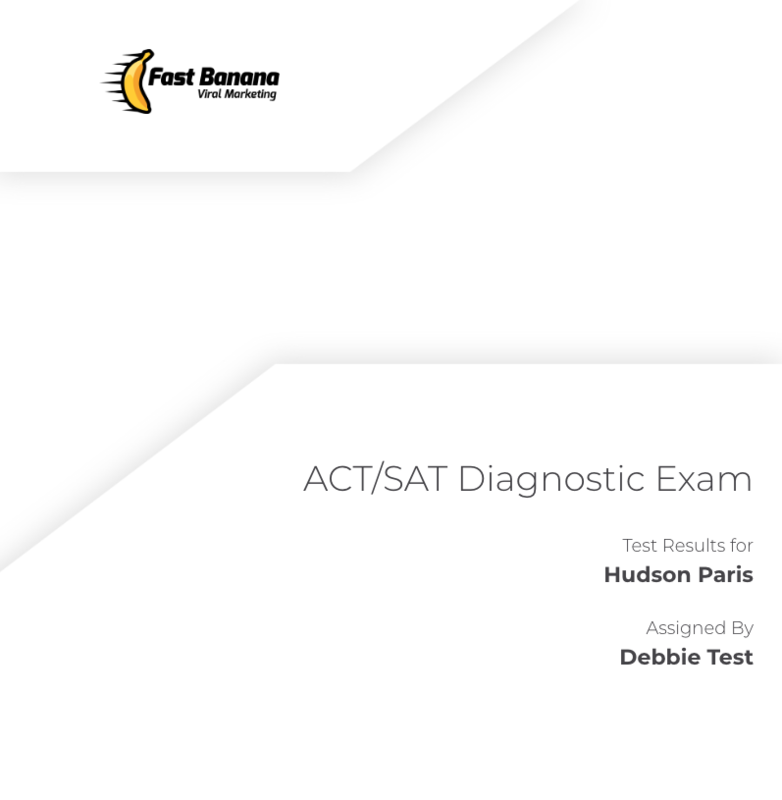 Counselors should advise parents that the SAT/ACT diagnostic is not meant to be predictive, but rather to determine whether a student is better suited to take the SAT or the ACT. It's not predictive because it's a test students are asked to take that does not count, and not every student brings his or her best effort. Also, once the areas that need attention are addressed, scores tend to improve. Sit down with the student and review the seminal differences between the two exams. Then leaf through a complete SAT and ACT so the student can compare the reading section to the reading section and get a sense of the differences. Do the same for the math and the English/Writing and Language sections. While you cannot compare the science sections (since there is no science on the SAT), you can go over the section with the student to see if timing might be something he or she can overcome. In many cases, students will feel more comfortable with one exam after experiencing both on the diagnostic. What if a student's results are equally strong on the SAT and ACT?